The Raspberry Jam Big Birthday is almost here! In celebration of our seventh birthday, we’re coordinating with over 130 community‑led Raspberry Jams in 40 countries across six continents this weekend, 3-4 March 2019. Raspberry Jams come in all shapes and sizes. They range from small pub gatherings fueled by local beer and amiable nerdy chatter to vast multi-room events with a varied programme of project displays, workshops, and talks. To find your nearest Raspberry Jam, check out our interactive Jam map. And if you can’t get to a Jam location this time, follow #PiParty on Twitter, where people around the world are already getting excited about their Big Birthday Weekend plans. Over the weekend you’ll see Raspberry Jams happening from the UK to the US, from Africa to – we hope – Antarctica, and everywhere in between. The first of this year’s Coolest Projects events is also taking place this weekend in Manchester, UK. 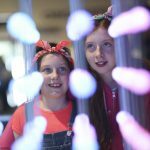 Coolest Projects is the world’s leading technology fair for young people, showcasing some of the very best creations by young makers across the country (and beyond), and it’s open for members of the public to attend. 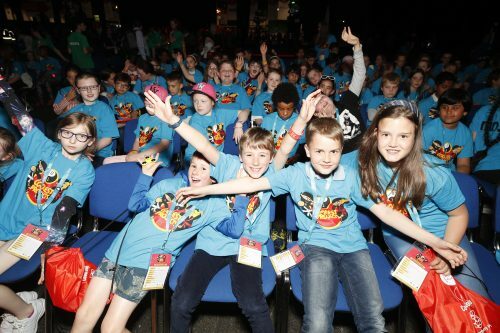 Tickets are still available from the Coolest Projects website, and you can follow the action on #CoolestProjects on Twitter. CBeebies’ Maddie Moate and the BBC’s Greg Foot will be taking over Raspberry Pi’s Instagram story on the day, so be sure to follow @RaspberryPiFoundation on Instagram. The post Celebrate with us this weekend! appeared first on Raspberry Pi. 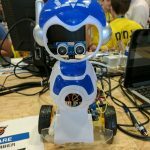 Coolest Projects, our world-leading technology fair for young people, takes place in seven countries this year: Ireland, the UK, USA, Netherlands, Belgium, Bulgaria, and Milan in Italy. Teams of marvellous volunteers organise and run the events in the Netherlands, Belgium, Bulgaria, and Milan! 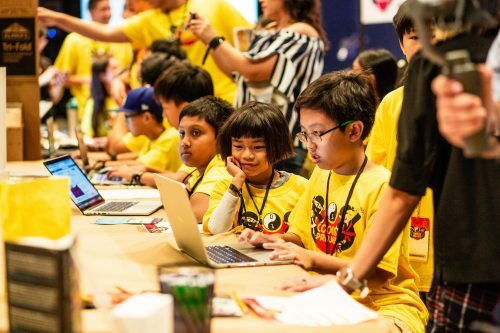 They are doing incredible work to give children in their regions the chance to present their tech creations and be celebrated for their skills and creativity. And we want to support you in our global community to do the same: organise your own regional Coolest Projects events, wherever you are, so that young people near you can showcase their work and be inspired by others’ inventions. 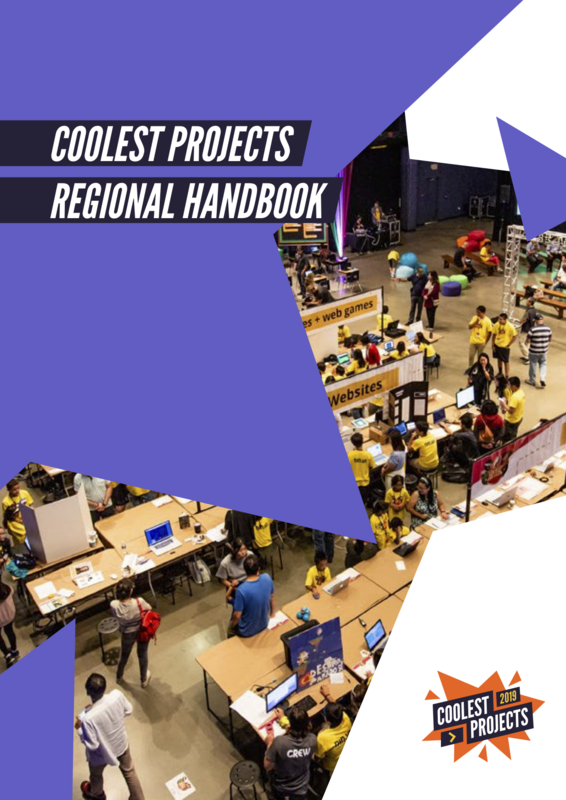 We’ve put together a free Coolest Projects Regional Handbook that walks you through everything you need to organise your own Coolest Projects event! Your regional event does not have to be large or formal — it can be as big or small as your community’s volunteers want it to be, and tailored to your community’s needs and interests. Like the volunteer teams who already run regional Coolest Projects, you too can run your own event — with our handbook as guidance. Download your free handbook now! 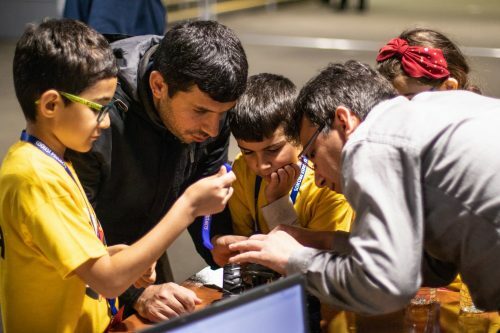 If you’re interested in bringing Coolest Projects to your community, email us at [email protected] so we can connect you to other volunteers in your region who have expressed their interest to us! Letting us know you want to be involved will also enable us to give you more support while you’re getting started. To participate in this year’s Coolest Projects, just register your project idea by the deadline (see below)! And don’t fret: you don’t have to have started your project to register, just the idea is enough. If you don’t want to present something by yourself, you can register in a team of up to five members. And you don’t need to have finished your project to present it at the event, because the most important thing is to showcase your love and enthusiasm for tech! Registration for all Coolest Projects events is free! And you’re also more than welcome to visit and check out the amazing projects without submitting your own. For more information, and to get your free visitor tickets, visit the Coolest Projects website and select your nearest event. 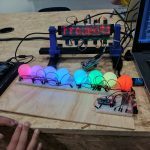 The post Our ultimate guide to running your own Coolest Projects event appeared first on Raspberry Pi. 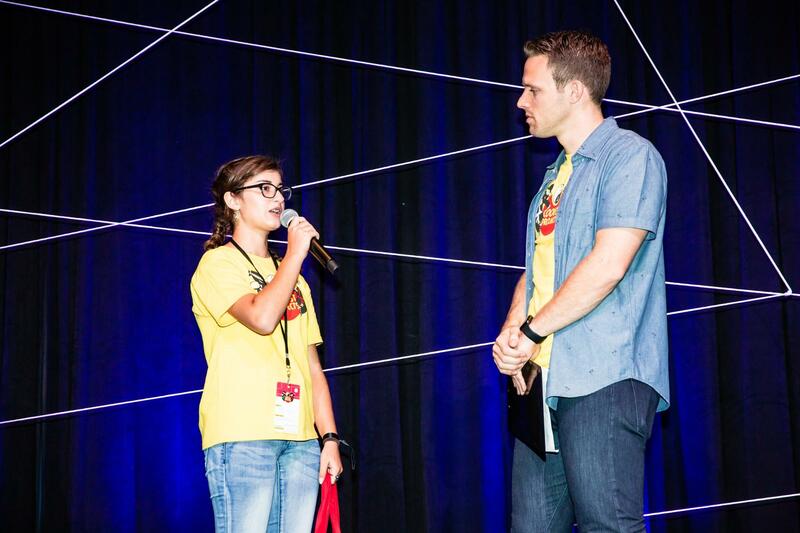 Parisa Khashayar is a high school freshman with a knack for coding. 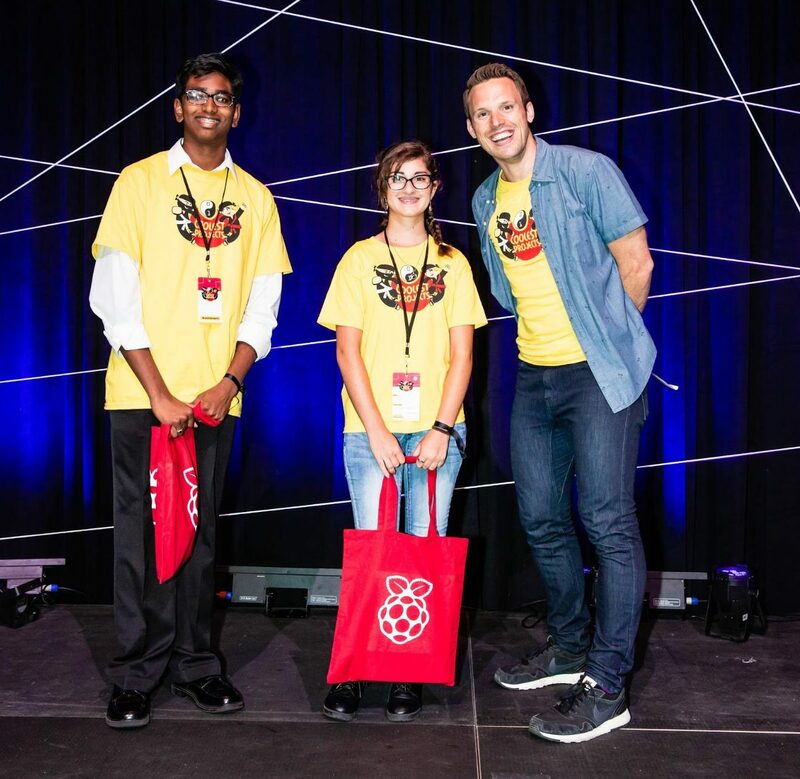 In September of 2018, Parisa had the chance to present her tech creation at Coolest Projects USA, and she made joint first place in the Hardware category. Since the sixth grade, Parisa has been teaching herself how to code; she has even taken classes during school holidays to further develop her learning. She’s also become quite the mechanic, fixing appliances around the house and steadily growing her tool collection. Besides coding and electronics, she also loves biology and hopes to study biomedical engineering in the future. Let’s hear from Parisa about her creation for Coolest Projects directly. A couple of years ago, there was a large wildfire near our house, and we happened to drive by a fire truck where an injured fireman was being treated. Firefighters risk their lives every day to keep us safe, but who makes sure they themselves are safe? I did some research and found that, despite all advances in technology, there are no real high-tech products out there that monitor firefighters’ condition while they are on mission. 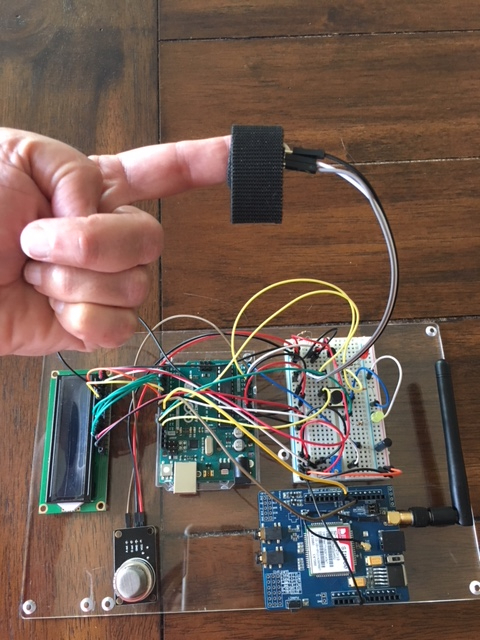 That is how my science project was born: I designed and prototyped a small board with multiple sensors that can be worn by firefighters. The device monitors conditions in the environment surrounding the fire, as well as the health of the firefighter; it relays this measurements to the command center via cellular technology. I submitted my project to the Broadcom MASTERS competition, and it was selected as one of the top 300 in the nation. Through Broadcom MASTERS I found out about Coolest Projects USA, and I entered this showcase in Santa Ana as well. 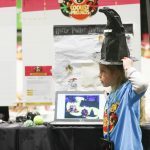 I have attended many science fairs, but Coolest Projects was different: it had a fun and friendly atmosphere, and kids of all different ages attended. After I arrived, I set up my project and then had a chance to walk around and talk to other kids to find out about their projects. It was very interesting and encouraging to see kids as young as 7 or 8 showing their work. Coolest Projects is a world-leading showcase that enables and inspires the next generation of digital creators and innovators to present the projects that they created at their local CoderDojo, Code Club and Raspberry Jam. 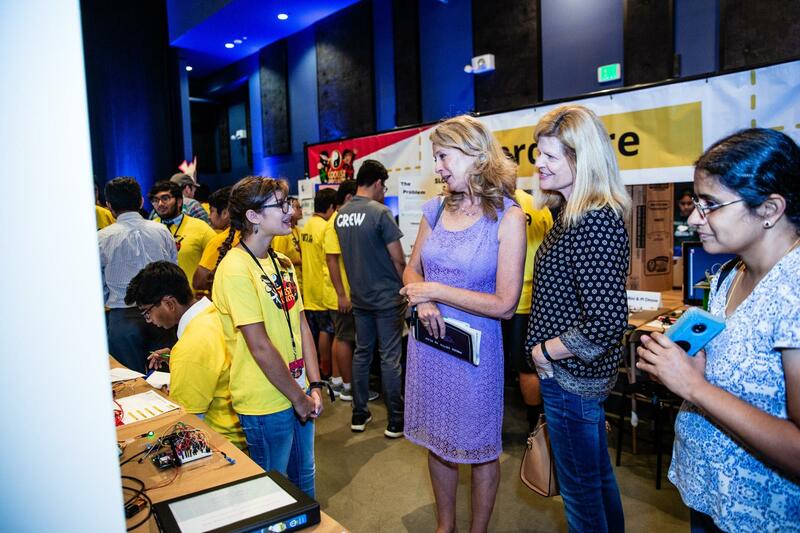 This year we brought Coolest Projects to the Discovery Cube Orange County for a spectacular regional event in California. We got the chance to rant about the endless problems we encountered with our projects, and to exchange notes about our solutions. It felt more like a friendly collaboration than a stressful competition. The judges were very kind and encouraging, which made the day even more pleasant. I received the first-place award in the Hardware category at Coolest Projects USA. I would like to attend Coolest Projects USA in 2019 with another project, or volunteer my time with them, because I think that Coolest Projects is one of the best ways to encourage kids to get into STEM! Since Coolest Projects, I have been working on my project to make my design smaller so everything can fit in a small, watch-size board. It is hard, and the progress is slow as I am very busy with high school work as well. Last summer I had an opportunity to introduce my design to the UCI Innovation program for UCI college students, and they let me to use their lab. I hope to be able to do the same this summer. As for now, I am currently volunteering at my local CoderDojo to help teach younger kids how to code. I want all the kids to know that coding is not scary — it is actually fun! 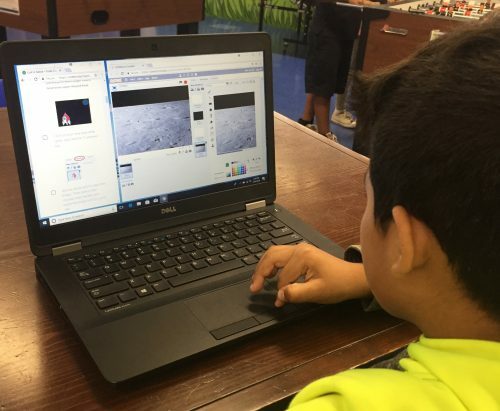 Coolest Projects USA is taking place on Saturday, March 23 2019, in Santa Ana, California, and project registration is now open. We’re also hosting events in Manchester, UK, on 2 March, and in Dublin, Ireland, on 5 May! Learn more about Coolest Projects events near you by visiting the Coolest Projects website. 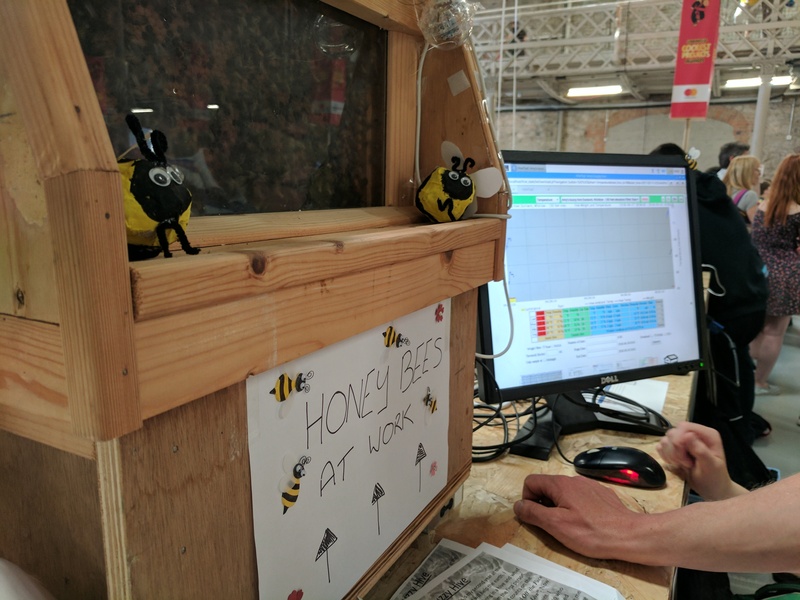 The post Firefighter monitoring system at Coolest Projects appeared first on Raspberry Pi. 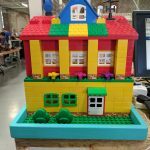 The post Announcing Coolest Projects 2019 appeared first on Raspberry Pi. Wherever in the world I meet members of the Raspberry Pi community, I am always amazed by their enthusiasm for learning and making. 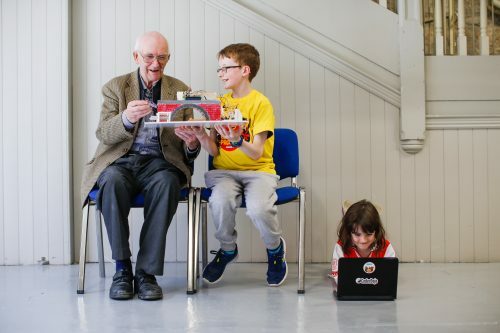 And I often meet families that are enjoying computing together: kids who have introduced their parents to something that’s a whole new world for them, adults who are sharing a hobby they love with their children or grandchildren or nieces and nephews, and whole families that are learning alongside one another. 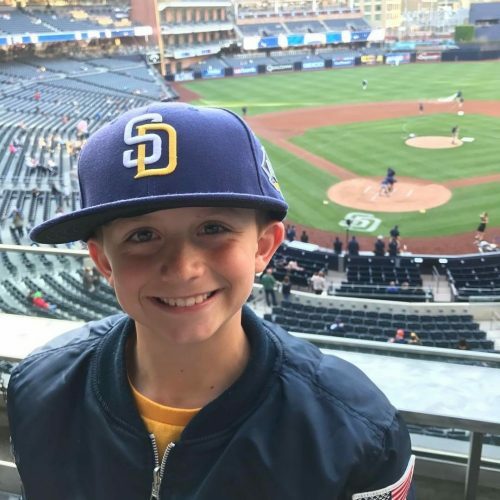 Earlier this summer, I met Raspberry Pi Certified Educator Heidi Baynes at Picademy in Denver, Colorado, and asked her about the Coolest Projects North America showcase event, which she and her son will be attending to on September 23 in Santa Ana, California. 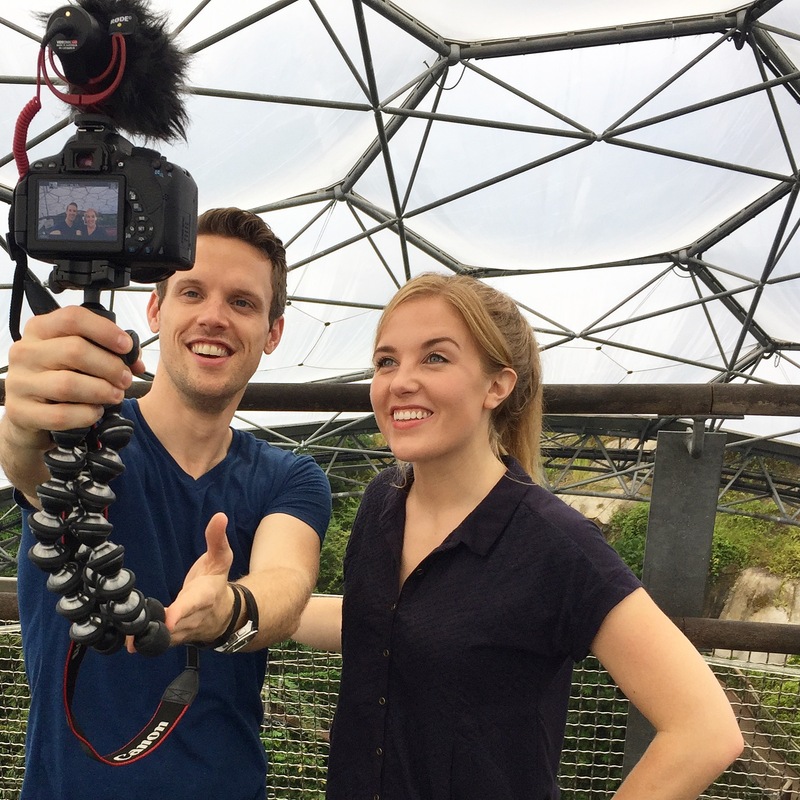 We hope you’ll join us there too, and to help you plan and build your own project to showcase, we’ve created a handy step-by-step guide for you to follow. 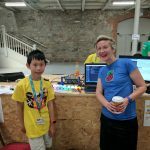 Heidi and I talked about how she got involved with the Raspberry Pi community, and what she and her son are looking forward to at Coolest Projects. 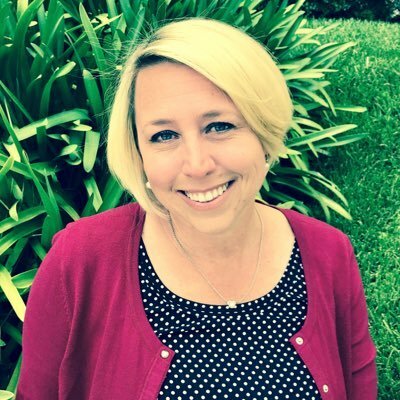 Christina Foust: Heidi, what makes you excited about Coolest Projects? 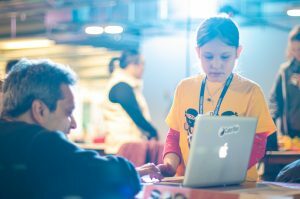 Heidi Baynes: I love the idea of bringing kids together from all over North America to share their excitement about computer science and digital making. 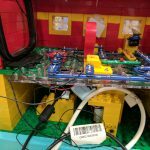 While I love all things Raspberry Pi, I like that this event includes projects from a variety of different sources. 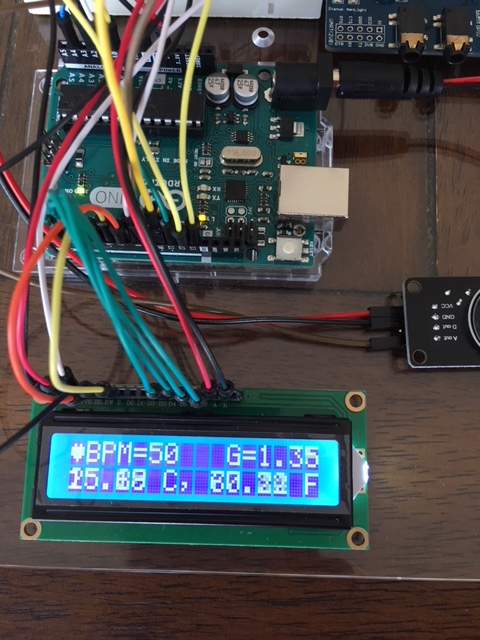 I’m excited to see projects built with Arduino, micro:bit, and other microcontrollers. I also can’t wait to see the digital creations that students have programmed as part of their coding classes and coding clubs. It’ll be a great celebration of computer science, robotics, and coding classes throughout North America. CF: I can’t wait either! We’ve got some great projects registered. You’ve been part of the Raspberry Pi community for a few years. Can you tell me what first got you involved? HB: As an educator, I was curious about Raspberry Pi and what it could mean for students and education. I applied to attend Picademy in the summer of 2016, and I was thrilled to be accepted to the Austin cohort. It was the most enriching professional development opportunity that I have ever attended, and I couldn’t wait to get back to my district and share everything I had learned. I’ve been lucky enough to continue my Picademy journey as a facilitator in Providence, Irvine, and just recently, in Denver. It’s been an opportunity of a lifetime to experience Picademy across the country and connect with so many wonderful educators! CF: We love that you’re a part of the Raspberry Pi community, and we’re excited to have you join us for Coolest Projects. Your son is registered to present his project, Star Wars Piano. Where did the idea for his project come from? HB: Music in general is a big focus in our house, so we purchased the Piano HAT to explore music and coding. As we searched through soundbites, we ran across a bank of Star Wars sounds and knew what we had to do. My son has talked about incorporating the piano into a costume so that different sound effects could be easily played while in character. CF: I love Star Wars! What is he most excited about for Coolest Projects? HB: He loves seeing what other kids have done and gets inspired by their creativity. In fact, as we’ve been talking about Coolest Projects and preparing his Star Wars Piano, he’s decided that he’d also like to try building a robotic car to share at the event. We’ve purchased the kit, and hopefully he’ll have time to complete it so he can share that project as well. CF: I love that he’s inspired to keep building. We’d love to have him share the car too. What is he doing to get ready to share his Star Wars Piano project? HB: He’s been adding a few more sound effects to his piano and is hoping to add another octave of sounds before he shares it at the event. We’ve talked about him creating images on the Sense HAT to play along with the sounds, so we’ll see what happens between now and then! CF: That’s super exciting! I can’t wait to see how the project evolves. Do you have any advice for educators or parents with kids considering Coolest Projects? HB: Stop considering and sign up! Don’t hesitate to come and share what you are working on, no matter how big or small the project might be. The Raspberry Pi and CS educator community is the most welcoming group of people. 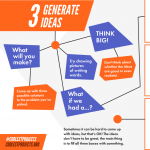 You and your students are sure to walk away with a few new ideas and some questions answered. We all learn from what others are doing. Your project could be the spark for someone else! 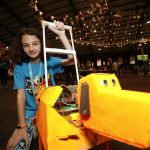 Coolest Projects will take place the Discovery Cube Orange County on September 23, 2018, and projects from young people with all levels of experience are welcome: we love to celebrate what kids and teens have created, whether they’re beginners showcasing their first projects, or seasoned makers! 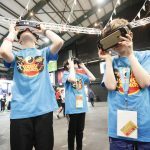 Find out how to attend the event and register your project at coolestprojects.org/northamerica. The post Coolest Projects: it’s for the whole family! 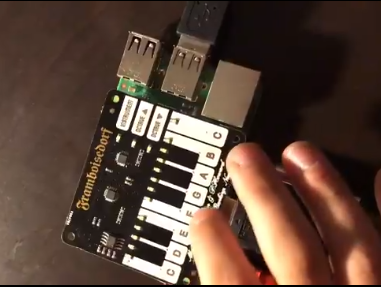 appeared first on Raspberry Pi. Located outside Los Angeles, the Boys & Girls Club of Bell Gardens run after-school and summer programming for youth in the community. The club at Bell Gardens is part of the Boys & Girls Clubs of America, a national organization of local chapters that offer after-school programs for young people. 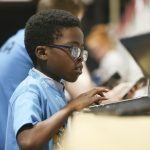 In September, their Code Club members will be heading to Coolest Projects North America to share their coding projects and connect with other young coders. At Bell Gardens’ Boys & Girls Club, activities center around healthy living and homework support, in addition to opportunities for kids to practice good character and citizenship, and to explore the arts and technology. But, as we know, rapid changes in technology mean needing to always be on the lookout for updated and kid-friendly materials. 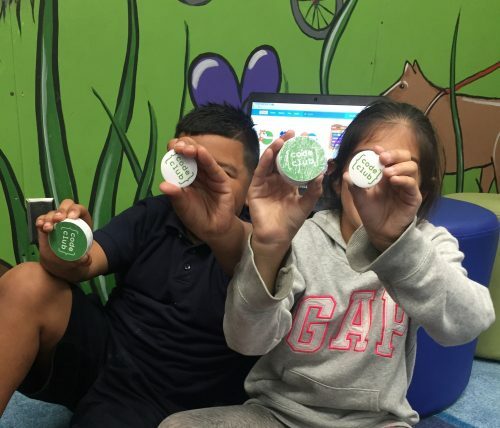 Therefore, Loren and her Boys & Girls Club team wanted to find resources that expose their kids to technology and empower them to contribute to society, to solve problems, or to simply get creative. 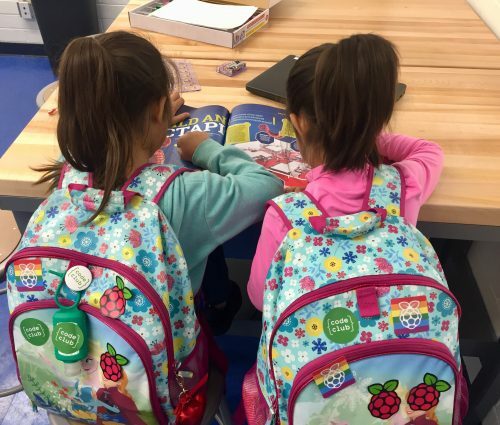 Loren found that Code Club, the Raspberry Pi Foundation’s longest-running outreach program, has just the resources and online project platform they needed to really level up their digital tech program. 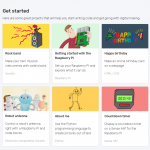 Code Club resources, like all resources provided Raspberry Pi, are user-friendly, accessible, and always free. I’ve seen a lot of internal and external growth in each member. I can honestly say that all the members have been impacted by the exposure to new resources and opportunities. Not only has their self-confidence improved, so have their skills in critical thinking, coding, and math. 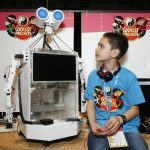 Coolest Projects North America will take place at the Discovery Cube, Orange County, on September 23, 2018. All levels of coders are welcome, and all types of projects are encouraged! Find tickets to the the event, register your project, and learn about travel stipends on the Coolest Projects North America website. 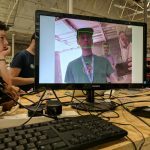 The post Bell Gardens’ Code Club is headed to Coolest Projects North America appeared first on Raspberry Pi. Like many engineers, I have folder upon folder of half-completed projects on my computer. But the funny thing is that this wasn’t a problem for me as a child. 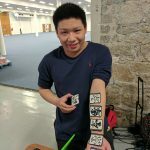 Every other Friday evening, I’d spend two hours at Ilkley Computer Club, where I could show off whatever I’d been working on: nothing motivates you to actually finish a project like the opportunity to share it with an audience. Raspberry Jams, Code Clubs, and CoderDojos all provide children (of all ages: we’re looking at you, Peter Onion) with a place where they can learn, share ideas, and make cool stuff with code and computers. But you can get so involved with the things you’re working on that you forget to take a step back every once in a while to look at what you’ve accomplished. And what do you do when you’ve shown your project to everyone you know, and you fancy a shot at a slightly larger audience? Enter Coolest Projects International, now in its seventh year. Here’s a video that captures about 1% of the awesomeness of being there in person. Coolest Projects is a world-leading showcase that empowers and inspires the next generation of digital creators, innovators, changemakers, and entrepreneurs. This year, for the first time, we brought Coolest Projects to the UK for a spectacular regional event in London! 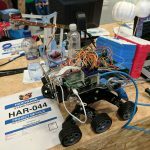 At this year’s event, more than 1000 children presented projects, from 15 countries including Argentina, Bulgaria, Italy, Japan, Romania, and Spain. 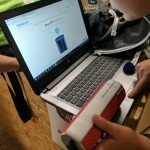 And for the first time, Coolest Projects was open to Raspberry Jam and Code Club members, and to the broader Raspberry Pi community. 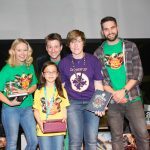 Liz, our daughter Aphra, and I spent the day at the event, along with the CoderDojo team, what felt like half the Raspberry Pi Foundation, keynote speaker Pete Lomas, and the most amazing army of volunteers. 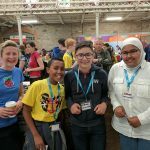 Between chugging slushies, I had the opportunity to judge hardware projects with Noel King, CoderDojo volunteer and co-founder of Coolest Projects. Noel provided the judges with a pep talk at the start of the day. He reminded us that the aim wasn’t necessarily to find the most complete, or polished, or technically audacious project, but to seek out creativity: the project that does something unique, or does something you’ve seen before but in a unique way. To my mind, the focus on creativity is what sets Coolest Projects apart. This is, after all, a contest that aims to “empower and inspire the next generation of digital creators, innovators, changemakers, and entrepreneurs”, and that recognises that each of those activities is, at heart, a creative pursuit. Unsurprisingly, given the strength of the field, judging went on for some time. Each category’s winner and runner-up were exceptional, and there were countless other projects that didn’t quite make the cut but that I’d be proud to have made myself. Where were these folks when I was a teenager? You can see the winners and runners up in each category on the Coolest Projects Twitter feed, and you should also check out the winners of the six special prizes. One that especially struck me was Selin Alara Ornek’s project, iC4U, a robot guide dog that she developed at her local CoderDojo in Turkey. 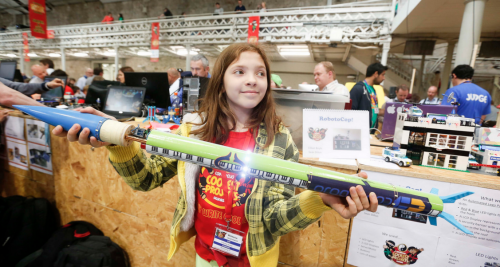 While Coolest Projects started in Dublin, it’s now an international phenomenon. In the last couple of months we’ve seen Coolest Projects regional events in Belgium, Romania, and the UK. 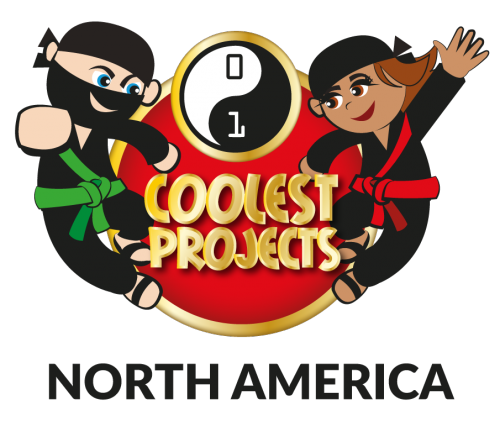 In September we’ll be holding the inaugural Coolest Projects North America at the Discovery Cube in Orange County. Coolest Projects began as a volunteer-run event, and we’re immensely privileged to have this wonderful showcase for our community. We are enormously grateful to all the staff and volunteers who continue to give huge amounts of their time, effort, and talent every year to make it the wonderful event that it is. Thank you, all of you. Events like these give me hope that the future of our industry will be every bit as exciting, and vastly more diverse, than our past and present. If you have a chance to participate in one of them, I think you’ll come away feeling the same. 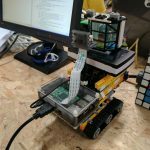 The post Coolest Projects International 2018 appeared first on Raspberry Pi. 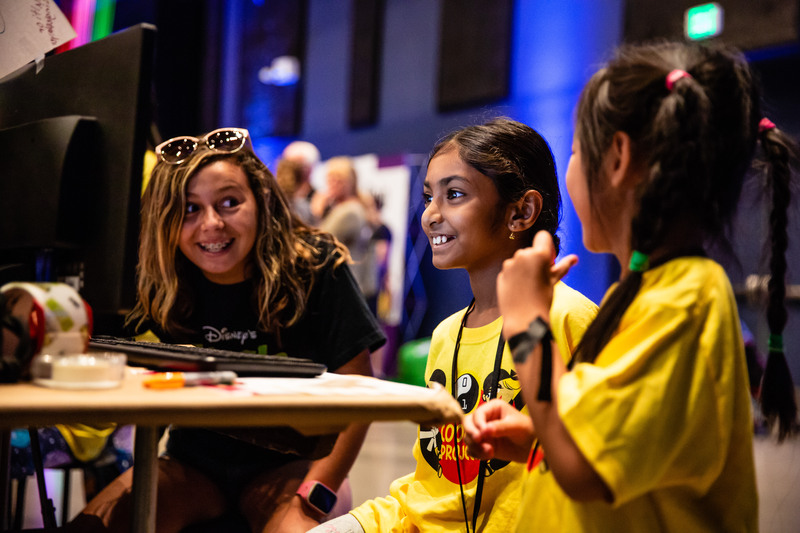 Coolest Projects is a world-leading annual showcase that empowers and inspires the next generation of digital creators, innovators, changemakers, and entrepreneurs. Young people come to the event to exhibit the cool ideas they have been working on throughout the year. 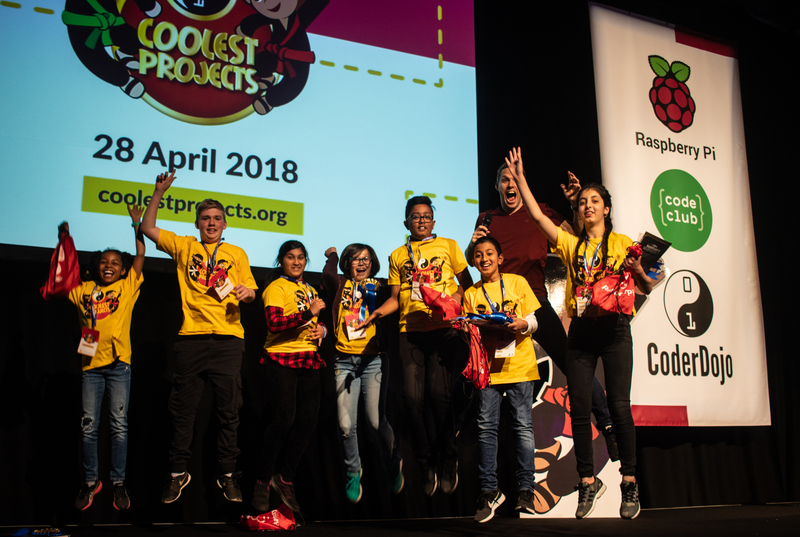 And from 2018, Coolest Projects is open to young people across the Raspberry Pi community. 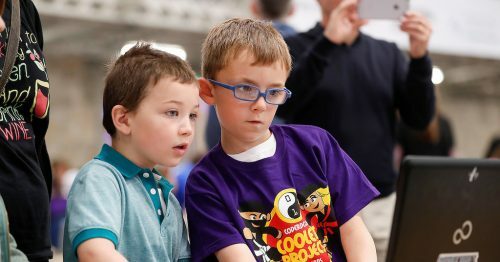 When Raspberry Pi’s Philip and Ben first visited Coolest Projects, they were blown away by the scope of the event, the number of children and young people who had travelled to Dublin to share their work, and the commitment they demonstrated to work ranging from Scratch projects to home-made hovercraft. 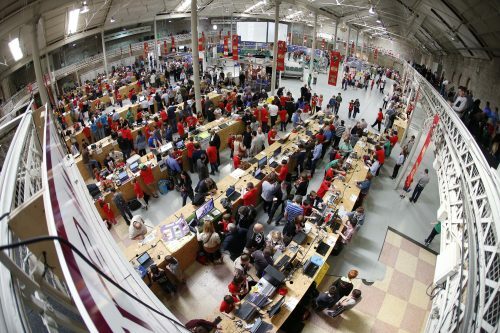 Coolest Projects International 2018 will be held in Dublin, Ireland, on Saturday 26 May. Participants will travel from all over the world to take part in a festival of creativity and tech. We hope you’ll be among them! As well as the flagship international event in Dublin, Ireland, there are regional events in other countries. 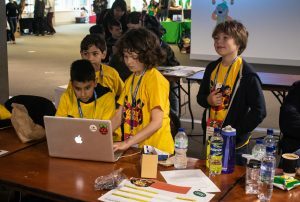 All these events are now open to makers and creators across the Raspberry Pi community, from Dojos, Code Clubs, and Raspberry Jams. 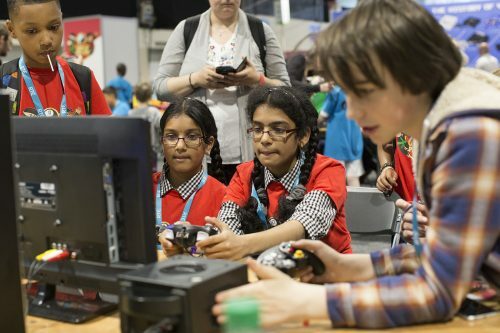 This year, for the first time, we are bringing Coolest Projects to the UK for a spectacular regional event! Coolest Projects UK will be held at Here East in London on Saturday 28 April. 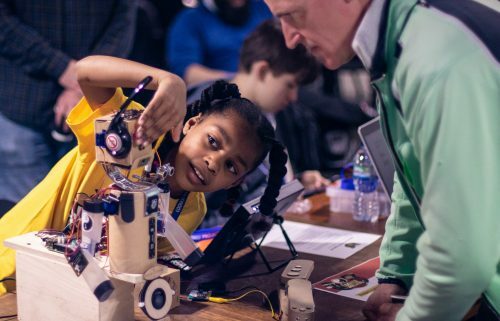 We’re looking forward to discovering over 100 projects that young people have designed and built, and seeing them share their ideas and their passion for technology, make new friends, and learn from one another. If you’re up to 18 years of age and you’re in primary, secondary, or further education, you can join in. You can work as an individual or as part of a team of up to five. All projects are welcome, whether you’re a beginner or a seasoned expert. You must be able to attend the event that you’re entering, whether Coolest Projects International or a regional event. Getting together with other makers and their fantastic projects is a really important and exciting part of the event, so you can’t take part with an online-only or video-only entry. There are a few rules to make sure everything runs smoothly and fairly, and you can read them here. Your project should fit into one of six broad categories, covering everything from Scratch to hardware projects. If you’ve made something with tech, or you’ve got a project idea, it will probably fit into one of them! Once you’ve picked your project, you need to register it and apply for your space at the event. 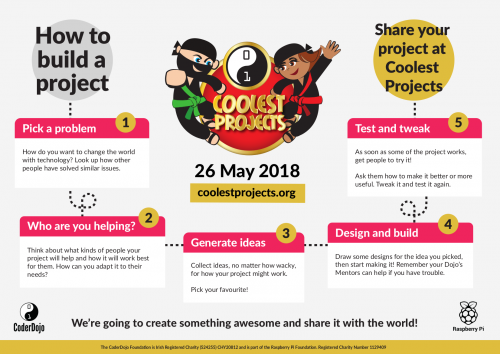 You can register for Coolest Projects International 2018 right now, and registration for Coolest Projects UK 2018 will open on Wednesday: join our email list to get an update when it does. There are places available for 750 projects, and our goal is to have enough room for everyone who wants to come. 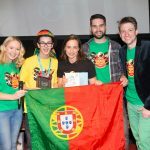 If more makers want to bring their projects than there are places available, we’ll select entries to show a balance of projects from different regions and different parts of our communities, from groups and individuals, and from girls and boys, as well as a good mixture of projects across different categories. 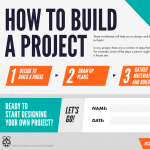 To help get your ideas flowing and guide you through your project, we’ve prepared a set of How to build a project worksheets. And if you’d like to attend Coolest Projects International, but the cost of travel is a problem, you can apply for a travel bursary by 31 January. Coolest Projects is about rewarding creativity, and we know the Raspberry Pi community has that in spades. It’s about having an idea and making it a reality using the skills you have, whether this is your first project or your fifteenth. We can’t wait to see you at Coolest Projects UK or Coolest Projects International this year! 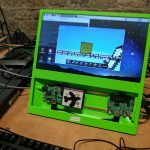 The post Coolest Projects: for young people across the Raspberry Pi community appeared first on Raspberry Pi. She asked for help, and you came to her aid. Pioneers, the winners of the Only you can save us challenge have been picked! I need your help. This is a call out for those between 11- and 16-years-old in the UK and Republic of Ireland. Something has gone very, very wrong and only you can save us. I’ve collected together as much information for you as I can. You’ll find it at http://www.raspberrypi.org/pioneers. In August we intercepted an emergency communication from a lonesome survivor. 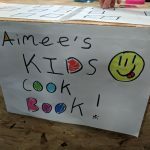 She seemed to be in quite a bit of trouble, and asked all you young people aged 11 to 16 to come up with something to help tackle the oncoming crisis, using whatever technology you had to hand. You had ten weeks to work in teams of two to five with an adult mentor to fulfil your mission. We received your world-saving ideas, and our savvy survivor pulled together a ragtag bunch of apocalyptic experts to help us judge which ones would be the winning entries. 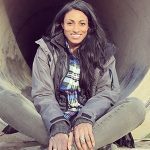 Dr Shini Somara is an advocate for STEM education and a mechanical engineer. She was host of The Health Show and has appeared in documentaries for the BBC, PBS Digital, and Sky. You can check out her work hosting Crash Course Physics on YouTube. 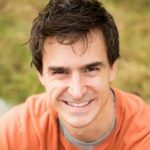 Prof Lewis Dartnell is an astrobiologist and author of the book The Knowledge: How to Rebuild Our World From Scratch. 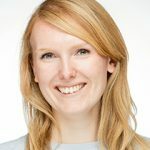 Emma Stephenson has a background in aeronautical engineering and currently works in the Shell Foundation’s Access to Energy and Sustainable Mobility portfolio. Our survivor is currently putting your entries to good use repairing, rebuilding, and defending her base. Our judges chose the following projects as outstanding examples of world-saving digital making. This is our entry to the pioneers ‘Only you can save us’ competition. Our team name is Computatrum. Hope you enjoy! Are you facing an unknown enemy whose only weakness is Nerf bullets? Then this is the robot for you! We loved the especially apocalyptic feel of the Computatron’s cleverly hacked and repurposed elements. The team even used an old floppy disc mechanism to help fire their bullets! 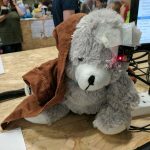 Thousands of lines of code… Many sheets of acrylic… A camera, touchscreen and fingerprint scanner… This is our entry into the Raspberry Pi Pioneers2017 ‘Only YOU can Save Us’ theme. When zombies or other survivors break into your base, you want a secure way of storing your crackers. The Robot Apocalypse Committee is back, and this time they’ve brought cheese! The crew designed a cheese- and cracker-dispensing machine complete with face and fingerprint recognition to ensure those rations last until the next supply drop. Hi! 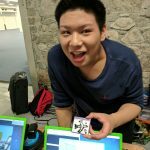 We are PiChasers and we entered the Raspberry Pi Pionners challenge last time when the theme was “Make it Outdoors!” but now we’ve been faced with another theme “Apocolypse”. We spent a while thinking of an original thing that would help in an apocolypse and decided upon a ‘text-only phone’ which uses local radio communication rather than cellular. This text-based communication device encased in a tupperware container could be a lifesaver in a crisis! And luckily, the Pi Chasers produced an excellent video and amazing GitHub repo, ensuring that any and all survivors will be able to build their own in the safety of their base. We all know that zombies are terrible at geometry, and the Three Musketeers used this fact to their advantage when building their zombie security system. We were impressed to see the team working together to overcome the roadblocks they faced along the way. Uploaded by CDA Bodgers on 2017-12-01. Playing piggy in the middle with zombies sure is a unique way of saving humankind from total extinction! 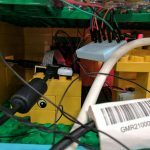 We loved this project idea, and although the Zombie Trolls had a little trouble with their motors, we’re sure with a little more tinkering this zombie-fooling contraption could save us all. 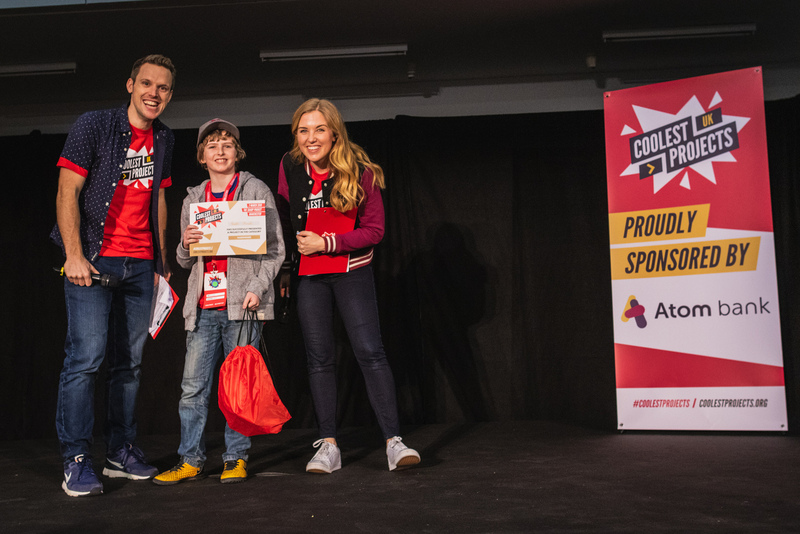 Our theme winners have also secured themselves a place at Coolest Projects 2018 in Dublin, Ireland! Thank you to everyone who got involved in this round of Pioneers. Look out for your awesome submission swag arriving in the mail! 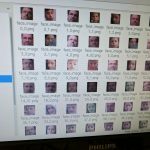 The post Pioneers winners: only you can save us appeared first on Raspberry Pi. 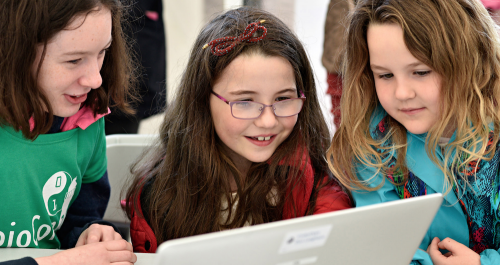 In March, the CoderDojo Foundation launched their Girls Initiative, which aims to increase the average proportion of girls attending CoderDojo clubs from 29% to at least 40% over the next three years. Six months on, we wanted to highlight what we’ve done so far and what’s next for our initiative. We’ve taken measures to ensure our resources are as friendly to girls as well as boys, and we are improving them based on feedback from girls. For example, we have developed beginner-level content (Sushi Cards) for working with wearables and for building apps using App Inventor. In response to girls’ feedback, we are exploring more creative goal-orientated content. 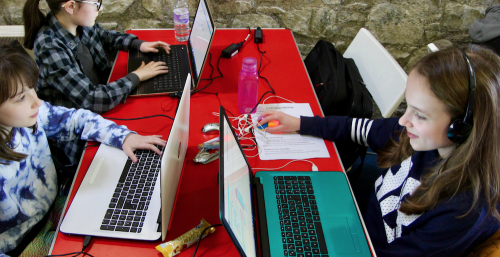 Moreover, as part of our Empowering the Future guide, we have developed three short ‘Mini-Sushi’ projects which provide a taster of different programming languages, such as Scratch, HTML, and App Inventor. We are currently finalising our intermediate-level wearables Sushi Cards. These are resources for learners to further explore wearables and integrate them with other coding skills they are developing. The Cards will enable young people to program LEDs which can be sewn into clothing with conductive thread. We are also planning another series of Sushi Cards focused on using coding skills to solve problems Ninjas have reported as important to them. In June 2017 we conducted the first Ninja survey. 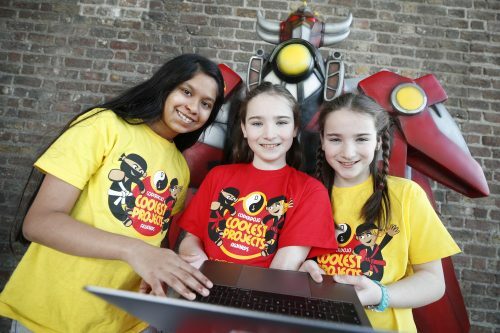 It was sent to all young people registered on the CoderDojo community platform, Zen. 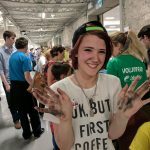 Hundreds of young people involved in Dojos around the world responded and shared their experiences. We are currently examining these results to identify areas in which girls feel most or least confident, as well as the motivations and influencing factors that cause them to continue with coding. Over the coming months we will delve deeper into the findings of this research, and decide how we can improve our content and Dojo support to adapt accordingly. Additionally, as part of sending out our Empowering the Future guide, we’re asking Dojos to provide insights into their current proportions of girls and female Mentors. We will follow up with recipients of the guide to document the impact of the recommended approaches they try at their Dojo. Thus, we will find out which approaches are most effective in different regional contexts, which will help us improve our support for Dojos wanting to increase their proportion of attending girls. Ruth and Alina (Ninja) talk about their Dojo and badging! 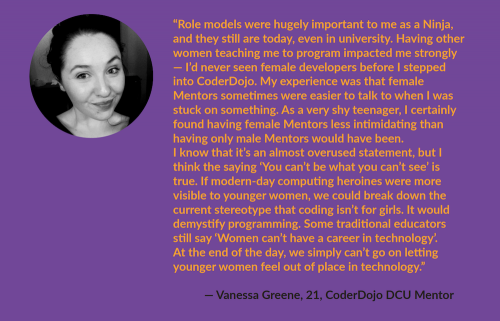 We recognise the importance of female role models, and over the coming months we will continue to encourage community members to share their stories so that we bring them to the wider CoderDojo community. Do you know a female Mentor or Ninja you would like to shine a spotline on? 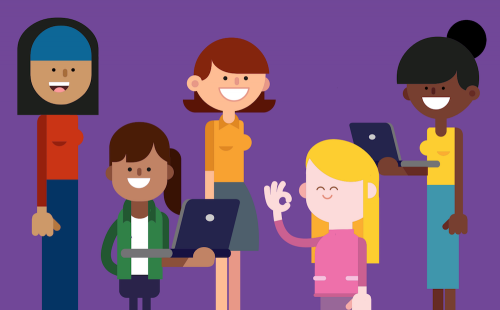 Get in touch with us at [email protected] You can also use #CoderDojoGirls on social media. 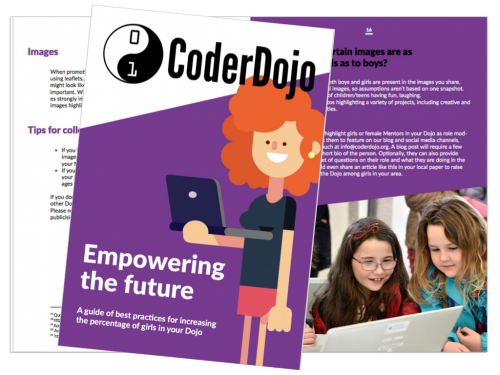 Ahead of Ada Lovelace Day and International Day of the Girl Child, the CoderDojo Foundation has released Empowering the Future, a comprehensive guide of practical approaches which Dojos have tested to engage and sustain girls. For the next month, Dojos that want to improve their proportion of girls can still sign up to have the guide book sent to them for free! From today, Dojos and anyone else can also download a PDF file of the guide. We would like to say a massive thank you to all community members who have shared their insights with us to make our Empowering the Future guide as comprehensive and beneficial as possible for other Dojos. 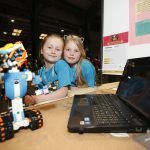 The post The CoderDojo Girls Initiative appeared first on Raspberry Pi. When I heard we were merging with CoderDojo, I was delighted. 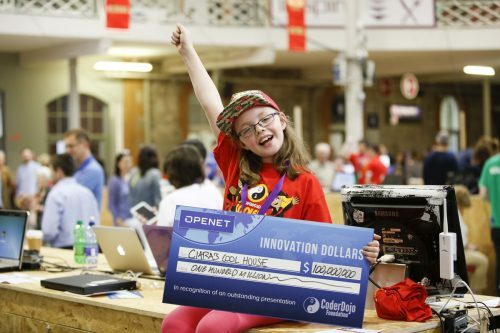 CoderDojo is a wonderful organisation with a spectacular community, and it’s going to be great to join forces with the team and work towards our common goal: making a difference to the lives of young people by making technology accessible to them. 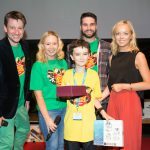 You may remember that last year Philip and I went along to Coolest Projects, CoderDojo’s annual event at which their global community showcase their best makes. It was awesome! 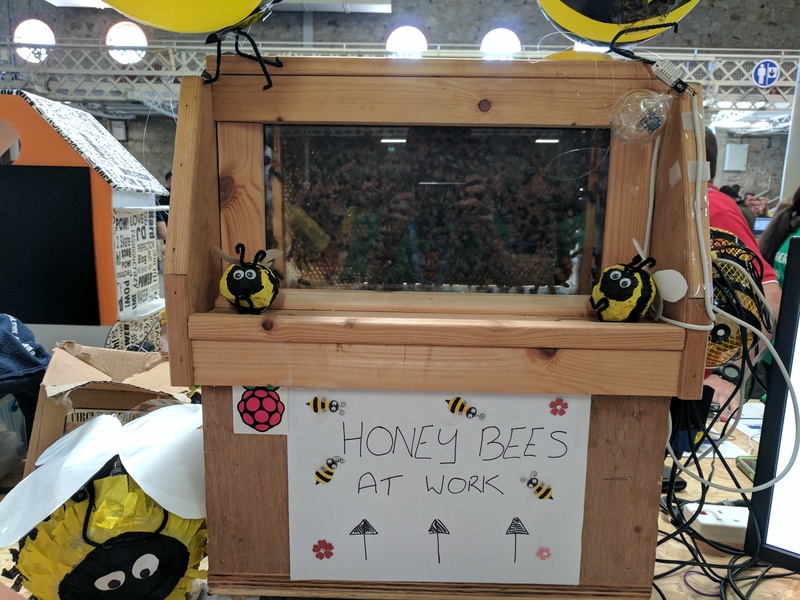 This year a whole bunch of us from the Raspberry Pi Foundation attended Coolest Projects with our new Irish colleagues, and as expected, the projects on show were as cool as can be. Next up, Aimee showed us a recipes app she’d made with the MIT App Inventor. It was a really impressive and well thought-out project. Helen’s and Oly’s favourite project involved…live bees! Philip’s favourite make was a Pi-powered robot you can control with your mind! According to the maker, Laura, it worked really well with Philip because he has no hair. Oly and I were massively impressed with the work of Mogamad, Daniel, and Basheerah, who programmed a (borrowed) Amazon Echo to make a voice-controlled text-adventure game using Java and the Alexa API. They’ve inspired me to try something similar using the AIY projects kit and adventurelib! Christopher Hill did a brilliant job with his Home Alone LEGO house. He used sensors to trigger lights and sounds to make it look like someone’s at home, like in the film. I should have taken a video – seeing it in action was great! 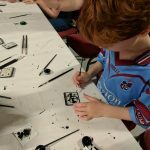 Meanwhile, the Northern Ireland Raspberry Jam group ran a DOTS board activity, which turned their area into a conductive paint hazard zone. We really enjoyed seeing so many young people collaborating, experimenting, and taking full advantage of the opportunity to make real projects. And we loved how huge the range of technologies in use was: people employed all manner of hardware and software to bring their ideas to life. Take a look at the gallery of all winners over on Flickr. It’s hard to describe the scale of the event, and photos just don’t do it justice. 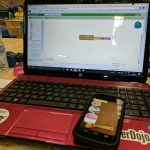 The first thing that hit me was the sheer excitement of the CoderDojo ninjas [the children attending Dojos]. Everyone was setting up for their time with the project judges, and their pure delight at being able to show off their creations was evident in both halls. Time and time again I saw the ninjas apply their creativity to help save the planet or make someone’s life better, and it’s truly exciting that we are going to help that continue and expand. Even after 8 hours, enthusiasm wasn’t flagging – the awards ceremony was just brilliant, with ninjas high-fiving the winners on the way to the stage. 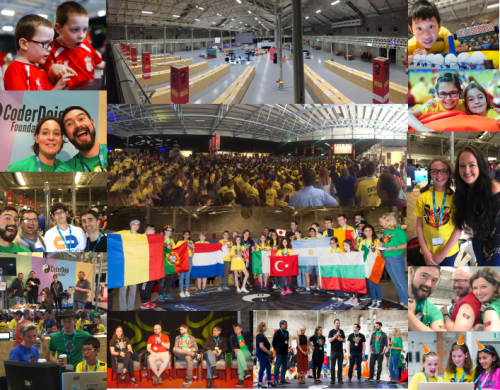 This speaks volumes about the ethos and vision of the CoderDojo founders, where everyone is a winner just by being part of a community of worldwide friends. It was a brilliant introduction, and if this weekend was anything to go by, our merger certainly is a marriage made in Heaven. 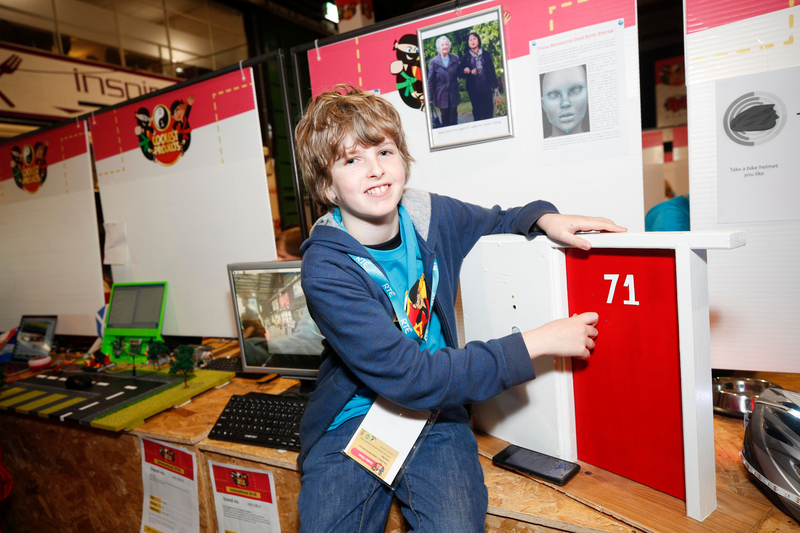 If all this inspires you as much as it did us, consider looking for a CoderDojo near you – and sign up as a volunteer! There’s plenty of time for young people to build up skills and start working on a project for next year’s event. 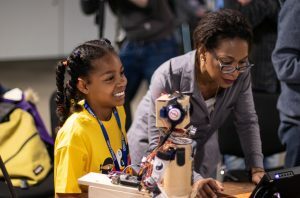 Check out coolestprojects.com for more information. 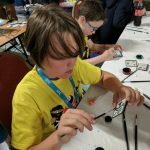 The post CoderDojo Coolest Projects 2017 appeared first on Raspberry Pi.